With Jarryd Wallace and Jonnie Peacock among those going for T44 100m gold at the Rio Paralympic Games, victory isn’t going to come easy. The American relishes the rivalry he has with Britain’s reigning Paralympic champion, though, and as a result Wallace believes Rio is set to be the scene for “something special”. While Peacock won gold in a Paralympic record-breaking 10.90 four years ago, Wallace left London without a medal following the disqualification of the US 4x100m relay team. Both athletes missed the 2015 IPC World Championships in Doha through injury and while Peacock goes into the event as the world No.1 thanks to his 10.68 PB from July, former world record-holder Wallace has run 10.71 this year and also beat the Briton on home soil – 10.80 to 10.87 – at the IPC Grand Prix Final. With USA’s world record-holder Richard Browne having made a shock retirement announcement earlier this year, the T44 100m – which gets underway with the heats on Thursday (September 8) and the final on Friday – would look to be a head-to-head battle between Wallace and Peacock for the title, but Wallace isn’t taking anything for granted. “Anything can happen,” he told AW. “It’s 100 metres, it’s a 10-and-a-half-second race. If someone puts a perfect race together they come from being out of the picture to being the big deal. 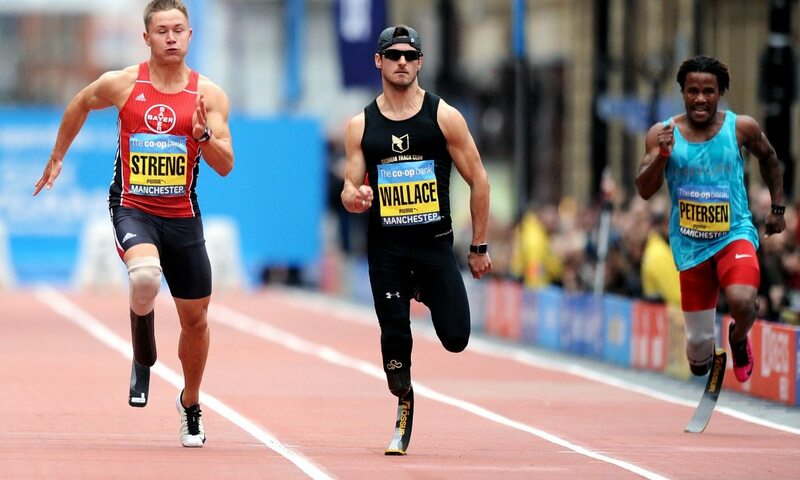 Wallace has made impressive progress since returning to running after the amputation of his right leg in 2010 and as the 26-year-old has pushed on, so too has the sport. “I’d rather lose in a race where I run my fastest time because it’s a great race than win slower,” he said. “It’s great for the fans and the sport. It’s nice to run fast and win races by 10 metres but it’s also nice to have some people to push you. That’s how you get faster. So just how fast does he think he can go? “I think a 10.4 is realistic not just for myself but others as well. Much faster than that the blades do inhibit you a little bit at the start and the finish,” Wallace said. “I do think that that is an achievable time. Whether that happens in Rio or not, there are a lot of things come into play. The prelims the day before, sometimes you have to run a hard one because of the field you’re in. The weather, nerves and all that comes into play.